A Royal Commission into child sexual abuse has been announced by the Prime Minister, Julia Gillard. 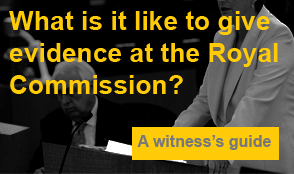 The creation of the national Royal Commission was announced on Monday 12 November. The Prime Minister was under pressure to act following growing calls for a national inquiry after explosive allegations by a senior NSW Police Investigator. The Royal Commission will look at all religious organisations, state care providers, not for profit bodies and the responses of child service agencies and the Police forces. The Roman Catholic Church will figure prominently in the inquiry. The terms of reference and the identity of the Commissioner will be announced in the near future. It is expected that ultimately the subject of compensation for victims will be addressed… and it won’t be the Australian tax payer who has to foot the bill; it will be institutions like the Catholic Church who will be contributing heavily to the fund, possibly similar to the fund for asbestosis victims set up by James Hardie. For more information regarding the Royal Commission into Child Abuse, contact Kelso Lawyers.